For many years, I’ve planned on building and electric hybrid bicycle for my general transportation needs. An electric motor that supplements the human operator increases range, cargo carrying capacity, and general enjoyment of the ride. A few hundred watts of additional power makes big hills feel like small ones. Added speed allows one to cut travel times down drastically. A regular bicycle is designed to be light weight, simple, and have low friction components because anything else would be intolerable. The electric motor and battery adds some weight, of course, but the power density of modern batteries more than makes up for the extra load. 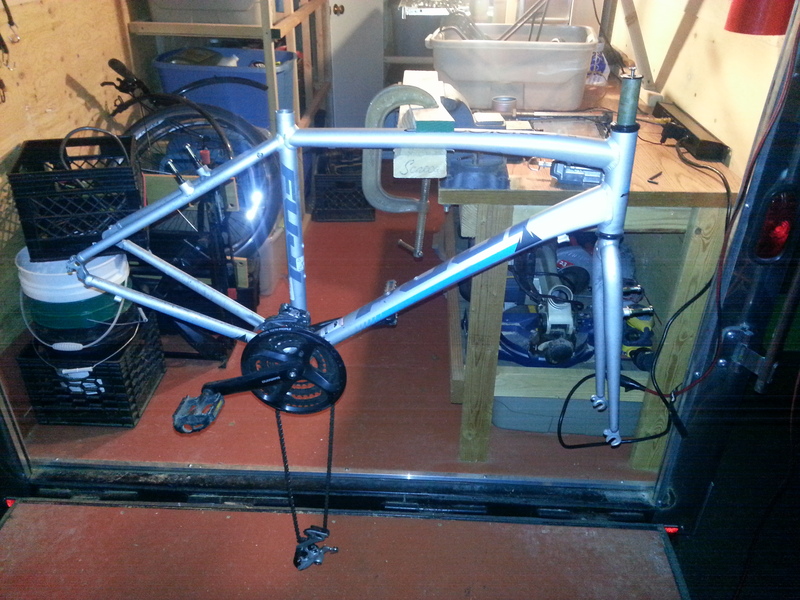 My current bike is an aluminum framed Fuji. I rode it for about 18 months back and forth to work which was a 4.2 miles round trip commute. I own a car, however such a commute by automobile is ridiculous. Besides, I detest cars; fine in the country, but they have little business in an urban setting. My bike rides were short and easy. Now, we live a bit farther away, and the round trip distance to work is 14 miles. A reasonable distance for a bike ride, yes, but it does take some time and I feel it would get rather boring. 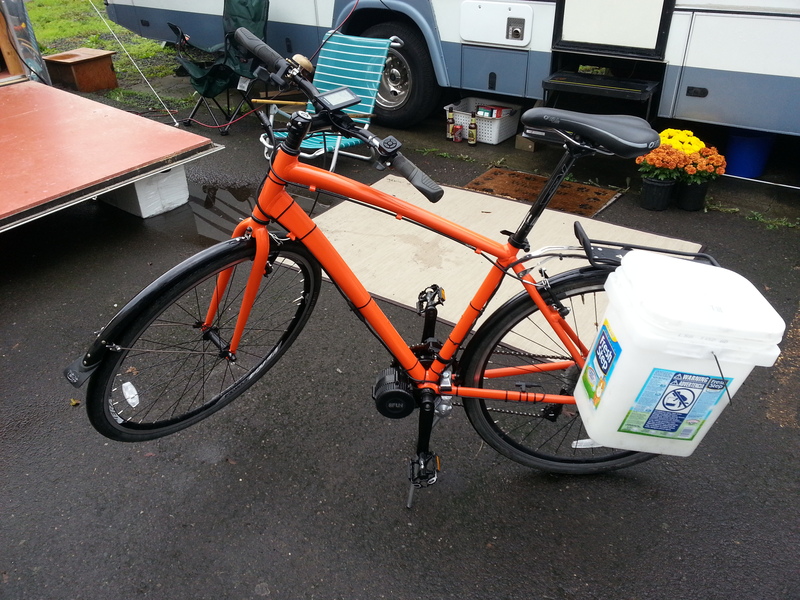 I felt it was time to electrify the bike and make something that is a low cost utility vehicle. I won’t say much about the various systems I considered, other than I chose a mid drive motor over a hub drive system because I felt that inputing power to the drivetrain and using the bicycle transmission would be a more efficient use of battery charge than a hub drive that operates over varying speeds. The Bafang 8FUN 500watt mid drive system gets fairly consistent favorable reviews, especially for the cost. A 36V 10Ahr Lithium Iron Phosphate battery from “Ping Batteries” was chosen as my power storage. I’m not going to outline the entire process of installing the kit, but I will say it takes a few specialized tools available at any well equipped bike shop. If you have any questions, feel free to shoot me an e-mail or leave a comment. 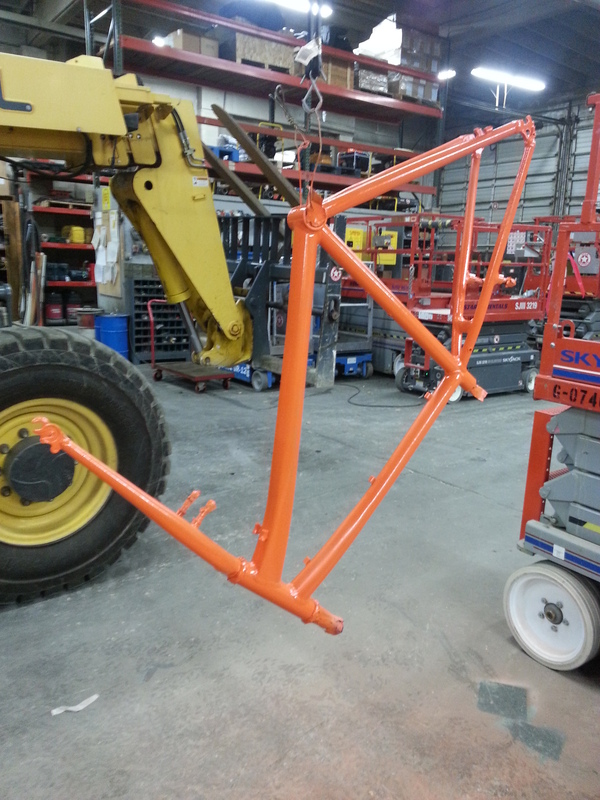 I never really cared for the silver color of the bike, so I went ahead and painted the frame with some purchased rattle can automotive paint in a color I like. I took my time and it came out pretty well, I think. The kitty litter bucket houses the battery. I found an old camera bag in the basement of Next Adventure sporting goods store, then I put my Ping battery in it with some foam padding. The whole thing sits in the bottom of the bucket. 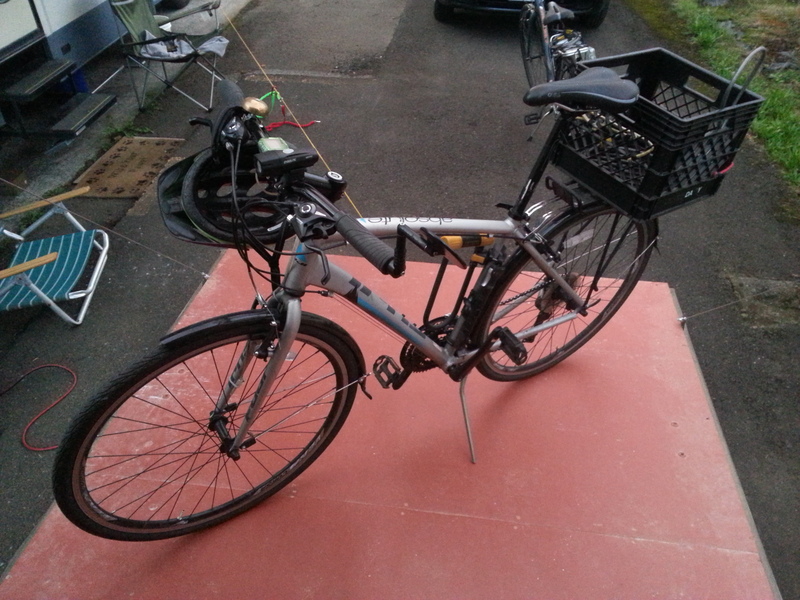 I can pull it out easily for charging..
My commute to work now is about 20 minutes, regardless of road traffic. Half of the trip is on a bike trail. Because of heavy traffic in the afternoons, I can surely beat a car back to my house. Even in good traffic conditions, a car takes 15 minutes and burns expensive gasoline. I take 20 minutes and charge with a few pennies worth of electricity. 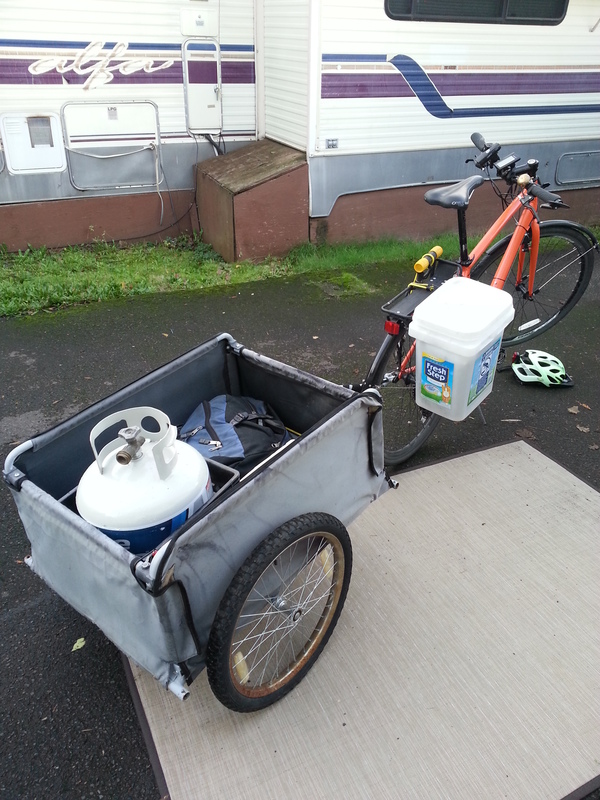 I even tow a trailer with the bike now. Our propane tanks need refilled regularly and I can tow the empty to work, fill it and tow it home. I always charge the battery at work and at home, but it would make the round trip if I didn’t use the throttle much. I prefer to keep the battery topped off if an outlet is available. This thing is going to take a while to pay for itself, but that’s ok because it sure is fun. I’m also biking a lot more than I otherwise would be, 255 miles in threes weeks. Although I get a lot of help from the motor, I still work up a sweat and get 20 minutes of cardio every day to and from work. Sweet ride man. I too have been looking into getting an ebike. The cost of a complete bike is outrageous!! So I’m more than likely going with the Bafang 8fun BBOS2, which is 750watt. The battery is currently heavier priced than the motor kit. Looking at getting a 48v 11.6ah battery. I can get the kit from Hong Kong for 499, and the battery from long island for 800. That’s 200$ cheaper than getting the kit w/battery from either website. I dunno really though about batteries. As for the motor kit, I got mine from lectric cycles, which was $650, and a bit more expensive than buying it direct from China. I figured, if I had problems, they would be easier to deal with. The Ping Battery was inexpensive and gets good consistent reviews. I have 670 miles on my setup, and have no complaints. Good luck to you!